"This is a quick and easy main dish. My kids don't even like cabbage, but they love this. I usually try to serve it with green beans, new potatoes, corn, and a pan of corn bread. They eat over half the pan every time. Also, the longer it stands the better it tastes." Heat a Dutch oven or large skillet over medium-high heat. Cook and stir beef and onion in the hot Dutch oven until browned and crumbly, 5 to 7 minutes; drain and discard grease. Add cabbage, tomatoes, tomato sauce, water, garlic, salt, and pepper and bring to a boil. Cover Dutch oven, reduce heat, and simmer until cabbage is tender, about 30 minutes. 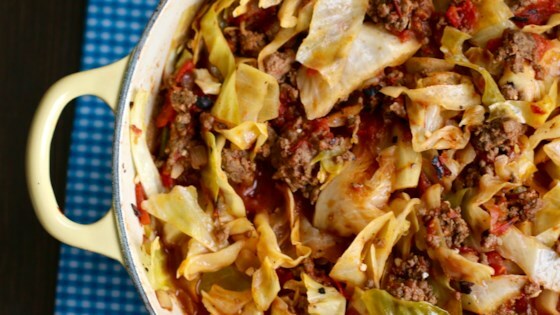 One pot meal with cabbage, meat, tomatoes and seasonings. For more flavor, I replace the plain tomato sauce with Campbell's Tomato Soup. Only thing I changed was I added 1 cup of water and 1 cup of rice. This tastes just like Halupki's without the mess of boiling the cabbage and wrapping with meat and rice. My family enjoys this recipe, but I add about 1/8 cup of vinegar & 1 tbsp of sugar to give it the flavor of the stuffed cabbage they love! Healthy, easy & delicious! !